On my birthday, I was very lucky to come home from my Pure Barre class to an amazing brunch, all thanks to my boyfriend, Justin. 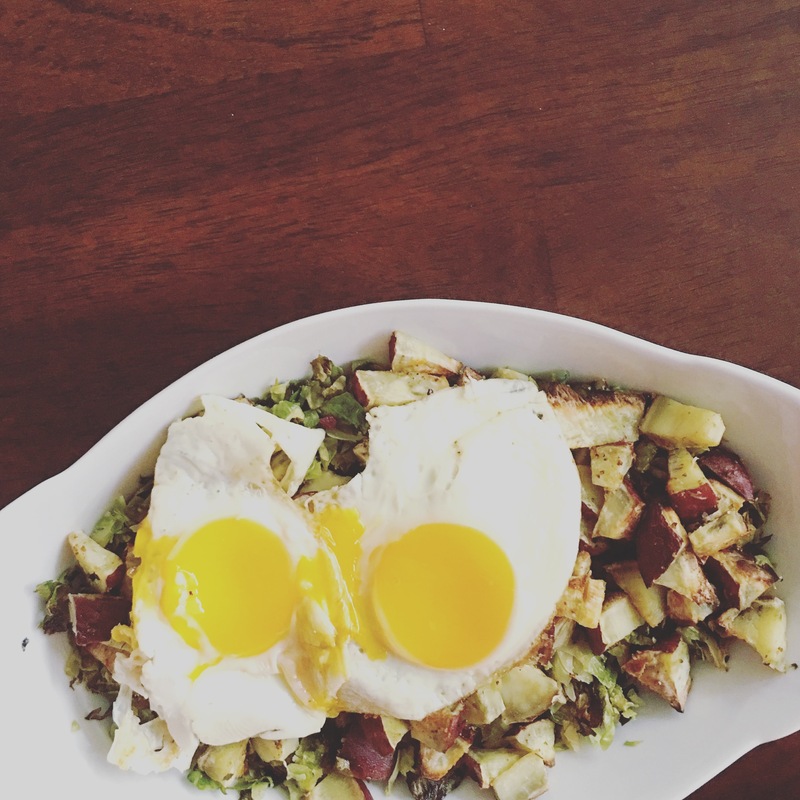 He took just about all my favorite foods and came up with this great brunch recipe. We have enjoyed it a few times since because it is just so good and I wanted to share it all with you. Warning it does take some prep and a good amount of time, but I promise you it is VERY worth it. While the potatoes are cooking; in a small frying pan sprayed with coconut oil cook the shredded brussel sprouts, chorizo and mushrooms on medium for about 20-25 minutes. In another small frying pan or in the same one – cook two eggs over easy. Once the eggs are cooked – turn off the stove and take out your sweet potatoes. Place the sweet potatoes onto a plate or bowl of choice then top with all the ingredients in the frying pan. Japanese sweet potato is my absolute fav! Same – they are SOOO good! I agree with you and Emily on the Japanese sweet potatoes- they’re my favorite! 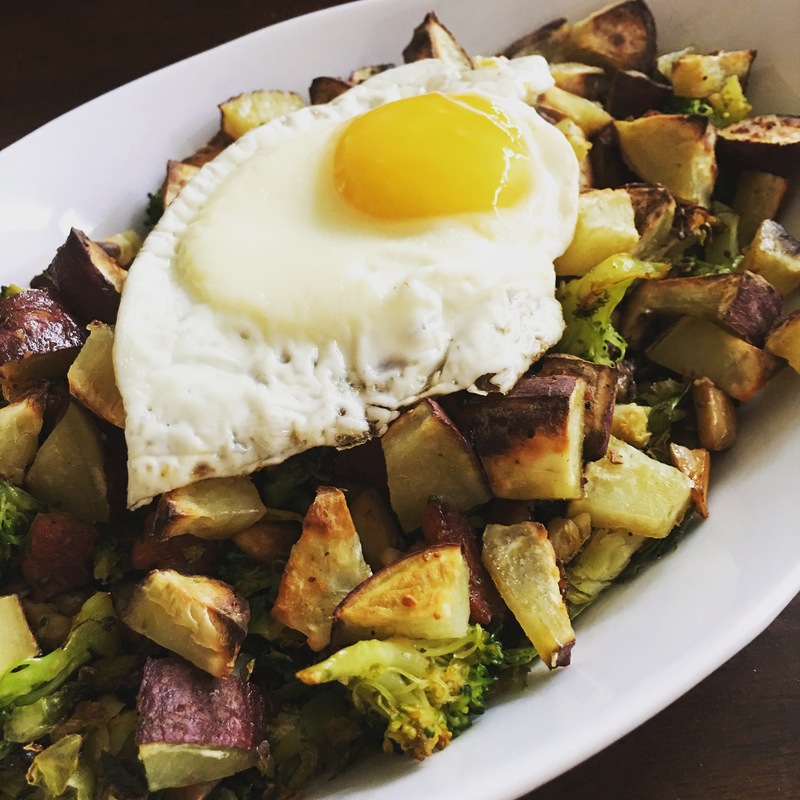 this breakfast is right up our ally- we always do a big batch of roasted veggies at the beginning of the week so i’ll often heat some up and put an egg on top for dinner! It is so goood 🙂 and the shredded brussels come in a bag at Trader Joes which makes it super easy!